Ever since Grace knit her Glazed Carrot Koolhaas, I’ve been wanting to knit a Malabrigo Koolhaas of my own. I have heard so many good things about this pattern, so I was really excited to finally start knitting it. I had originally planned to knit the men’s sized hat so that Kenny and I could have a hat that we could both wear, but as you can see that’s not what I ended up doing. For some reason I just couldn’t get into a rhythm on the cable rounds! They really took me forever. I started the hat yesterday morning and I must have taken at least 20 breaks while knitting it. The pattern was absolutely easy to understand so it wasn’t that, and I basically had the pattern repeat memorized right from the start, but rows 1 and 5 (the two main cabling rounds) must have took me almost an hour each. When I started dreading each time one of these rows came around, I decided that I’d cut the hat short and make a little beanie for Camdyn. One of the main problems I think was that the skein of Malabrigo I chose was the fluffiest and most cloud-like skein that I’ve worked with so far this month. Normally that’s not a bad thing, but every time I went to do one of the cables (which I was doing without a cable needle) the stitch puffed up when I dropped it off the needle and it was really difficult to try to get every strand of fiber picked up again. I do realize I probably could have switched to using a cable needle, but I know I would have absolutely given up if I would have had to break out the cable needle every couple of stitches. 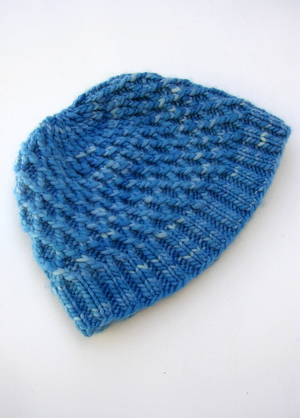 While knitting this hat I also realized how tightly I knit. Normally this isn’t such a problem for me, but I found myself fighting to even knit the stitches on the cable rounds because they were so tight. This really took a toll on my hands—another reason why I took so many breaks. I really need to learn how to loosen up a bit I think! 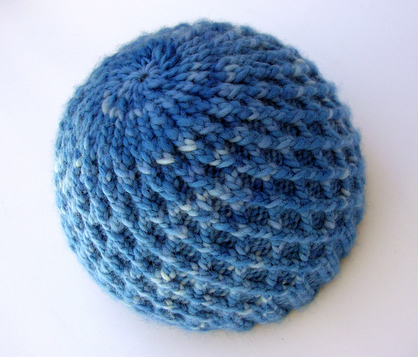 Even though I didn’t enjoy knitting this particular hat as much as normal, I do think it turned out cute. I feel it would have fit Camdyn a bit better if I would have done another half of a repeat of the lattice pattern. The hat right now is unblocked though, so if I need to stretch it out a bit I can probably achieve the length I want during blocking. 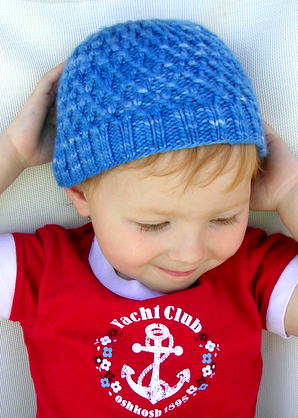 I know it’s hard to believe, but I do plan on attempting this pattern again some day—though not with Malabrigo. Next time I’ll choose a nice smooth yarn so that I don’t have to fight with the cables so much. The lattice pattern is just so pretty you can’t help but love looking at it!